Las Vegas, U.S. - Information is received by reading visible light ID from digital signage or LED illumination(Light IDs are like barcodes or QR codes written in light). This technology is useful in crowded area where it can be difficult to access IDs. 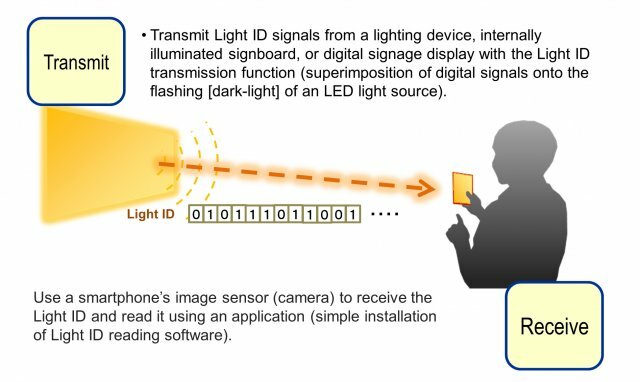 Panasonic Corporation has pushed the envelope of visible light communication technology and developed the new light ID (identifier) technology. Light ID using conventional visible light communication technology had a dilemma. Transmission rate was very low (approx. 10+bps) using a camera installed in a smartphone as a receiver, on the other hand, a special light receiving device is required for high-speed communication. It hampers the spread of visible light communication. But the newly developed technology only requires users to download an app onto their smartphones, and also realizes transmission rates that are couple hundred times higher (several kbps). The signal source is a flashing white LED of several thousand hertz and it can be installed in digital signage as a backlight as well as spotlights for works of art in museums and products in stores. Easier detection: Unlike image reading methods such as QR codes or AR markers, this technology does not require users to hold the receiver in a specific position, and it also does not require time for focusing and complex image recognition. All users have to do is point the smartphone camera towards an LED light source or the illuminated object, and the app will immediately recognize the Light ID even from a distance, eliminating the need to navigate through crowds to approach light source codes. Higher transmission rate: The information is then read by dividing the received images into blocks. This enables rapid decoding of information at a rate surpassing that of smartphone video recording (frame rates). Low interference and location-free: Unlike information transmission systems using Bluetooth(R) or ultrasonic waves, radio and sound wave interference is not an issue, which makes it possible to provide different sets of information via multiple Light ID transmitters installed in adjacent locations. Panasonic's newly developed visible light ID technology is expected to play an active role in various places. It sends valuable information for foreign tourists at a train station or visitors to facilities such as a museum and exhibition. The technology also helps to realize effective Online to Offline (O2O) marketing.